5 medium black olives, sliced. 1/2 teaspoon red chilli flakes. 3-4 fresh basil leaves, roughly torn. 1. 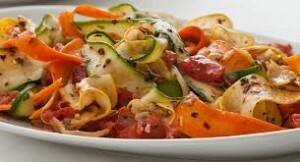 Cut the zucchini, carrots and cucumbers length ways sprinkle into thin ribbons with a potato peeler or a manual slicer. A little salt and set aside for five minutes. 2. Process the vinegar, soy sauce, brown sugar, chilli flakes, basil leaves and salt to a coarse paste in able transfer to a bowl. 3. Squeeze the cut vegetables to remove excess liquid. 4. Add the vegetables to the dressing in the bowl and toss well. 5. Serve, garnished with olive slices. Vegitable is among of healthy foods. It is examine that people who eat more vegetables and fruits are likely to have a reduced risk of some chronic diseases. Vegetables provide important nutrients. These are essential for health and maintenance of body. This vegetable salad is full of potassium. It is a very important nutrient for people suffering from high blood pressure.It consist of sufficient quantity of potassium. Potassium provide aid to low high blood pressure. It provide benefits for heart disease. According to a study eating raw vegetables increases the basal Metabolic Rate. Vegetable salad helps to loss weight. Folic acid (Folate ) provide helps the body form healthy red blood cells. Vegetable provide folic acid. These are very beneficial for Women of childbearing age. It provide aid to reduce the risk of neural tube defects. Eating vegetables can reduce the risk for stroke. It reduce cancer, heart diseases and type-2 diabetes. Eating vegetables that are lower in calories per cup. It is useful in helping to lower calorie intake.